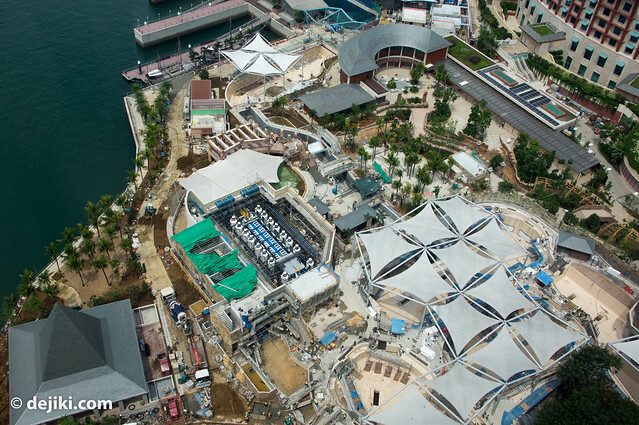 Let’s take a look at what’s been happening at the Marine Life Park. Please refer to the first entry for more information about the park. 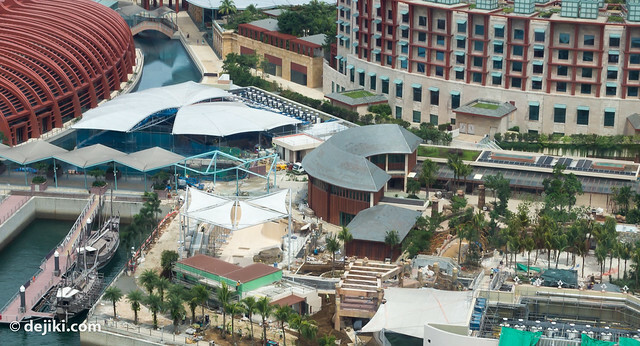 There’s still a lot of construction going on, but progress is steady: Most of the structural work for the canals (for Adventure River and Marine life) are completed, and more decorative elements are starting to appear. When will the park open? It looks likely to be anytime between September to December 2012. I forgot to mention in the previous entry this large structure that’s beside the Maritime Experiential Museum. In this photo, it’s beside the red building. It is heavily sheltered, unlike the open pools in the Marine Life Park. Could be a theater of some sorts, though it’s too early to say. More mysteries surround this building, but here we can see how the pool, that the Adventure River circles around, look like. 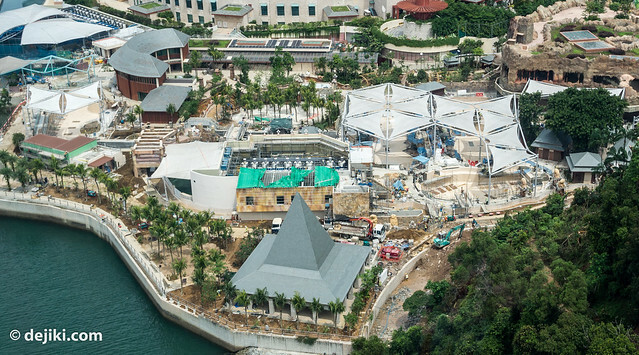 It’s also early to comment, but from the looks of thing from the air, the park has everything packed very closely, just like Universal Studios Singapore. I’ll be keen to know how the different elements actually fit together on the ground. There’s at least four different styles going on here now, and some other sections of the park have even more complicated mix of visual elements. I’m not sure what zoning strategy is used for this park, other than “maximize the space available”. The large pools here have different depths. The one of the left is the most shallow. The one on the right, appears to have some glass panels (those long rectangular pieces on the wall of the pools). It’s hard to see from the air, but there should be some way to get down (through the adjacent buildings, I guess). 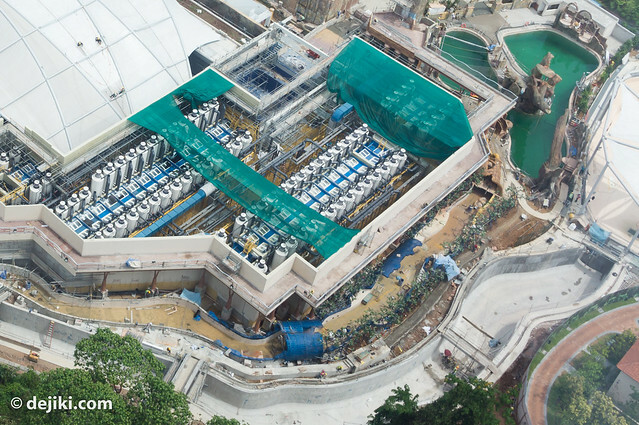 Initially the park planned to have very open atrium areas where guests choose to walk at street level, to view the tanks above water level. Or they can go to the lower level and walk beside the tanks and view them. 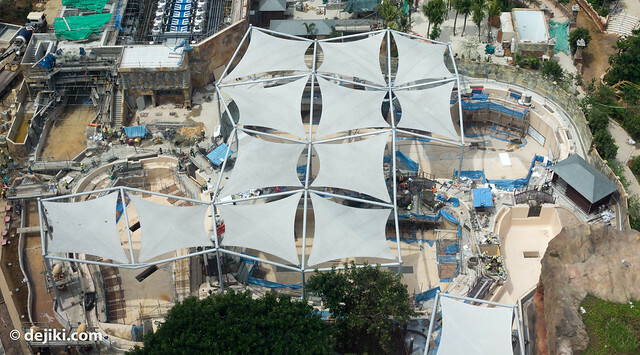 While it seems that the park will still keep this feature, just that it won’t be as “open” as initially planned. 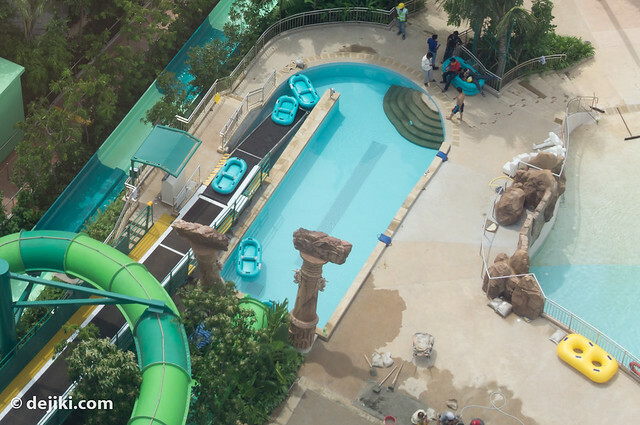 Over at the “Equarius Side”, the water jets at the Reef Swim area were turned off, and the “shark tooth-shaped” pool next to it has water now. 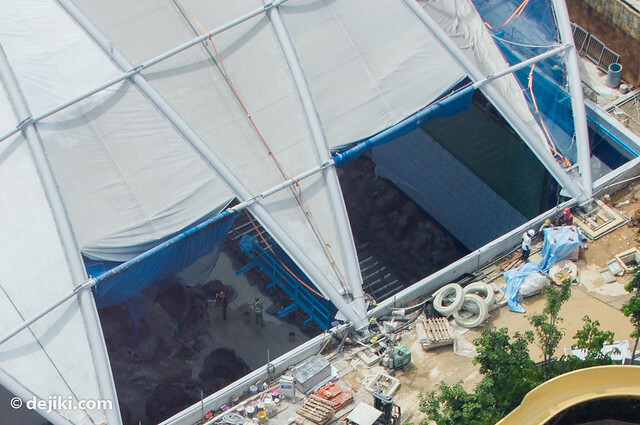 Also, it’s a bit hard to see, but notice that there is a walkway here (circling the filtration tanks area) for guests to walk from the Rock building to the “Equarius Side” of the park.It will also give a nice view of what’s going on at the Adventure River. Construction has commenced for thematic elements along this section of the Adventure River. Most of the white covers for the big aquarium have been pulled out now, leaving a smaller window to see what’s happening inside. But it looks like construction has been going well, with most of the construction pallets, seen in the last update, all gone! Towards the left appears to be the glass panels, protected by the white films for now. Now this is interesting. On the left, we see the nice thematic detail for the Adventure River. Nothing much for the thrill-filled section of the park. There’s more “ride vehicles” there. 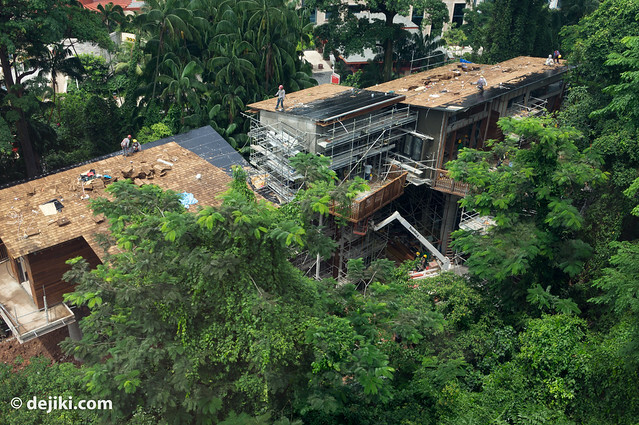 Apart from the Ocean Suites, the park also provides more accommodation options in the form of treetop lofts. They’re right beside the wave pool area. That’s all for now. Stay tuned (Subscribe!) for the next update in a few weeks. I especially love the design of adventure river, and I hope it will be interactive as well. Anyway, can’t wait to go! Thanks for the update. It looks like a September opening is possible. 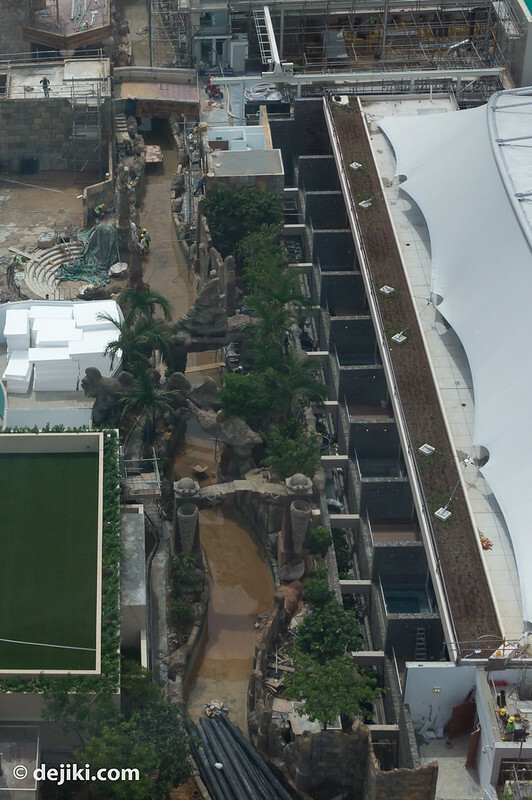 I would guess that the heavily sheltered structure in photo 3 is some sort of isolation or quarantine pool for sick and new animals. The pools of varying depths in photo 5 is probably the dolphin habitat. Thanks for leaving your insights. It does make sense that the pools could be for the dolphins – after all all these pools are connected together and also lead to the large outdoor pool (near the Beach Villas). Speaking of September Opening, is it possible that this is RWS’s move against Legoland Malaysia?? I highly doubt it. One is a marine life/waterpark hybrid while the other is a theme park catered for young children – different features and they both cater to different target audiences. 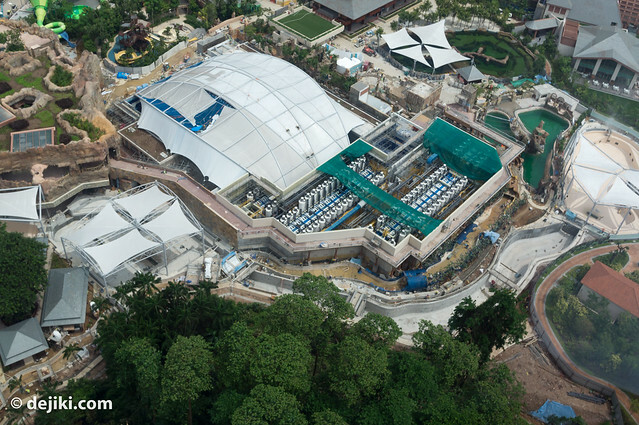 It makes more sense for RWS to compete with River Safari, which is expected to open at around the same period. very nice post, i certainly love http://dejiki.com, keep on it !!!! !